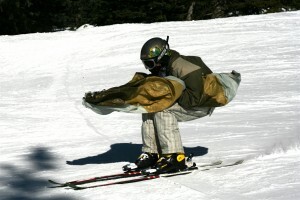 Ski Wings are made of nylon fabric and webbing Weighing less than a pound, they attach to the skier’s poles and store in a waist pack when not in use. 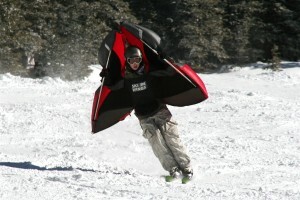 I have sold over 700 Ski Wings but I’m sold out of inventory at this time. 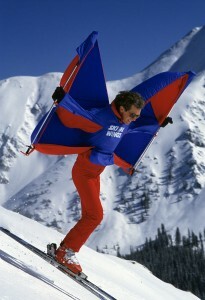 I have been compiling a list of people who want Ski Wings when they become available. 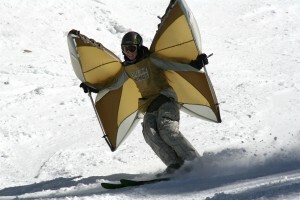 Please email me at the address at the bottom of the page if you want me to contact you when I have Ski Wings available. A skier’s forward movement creates an apparent wind. 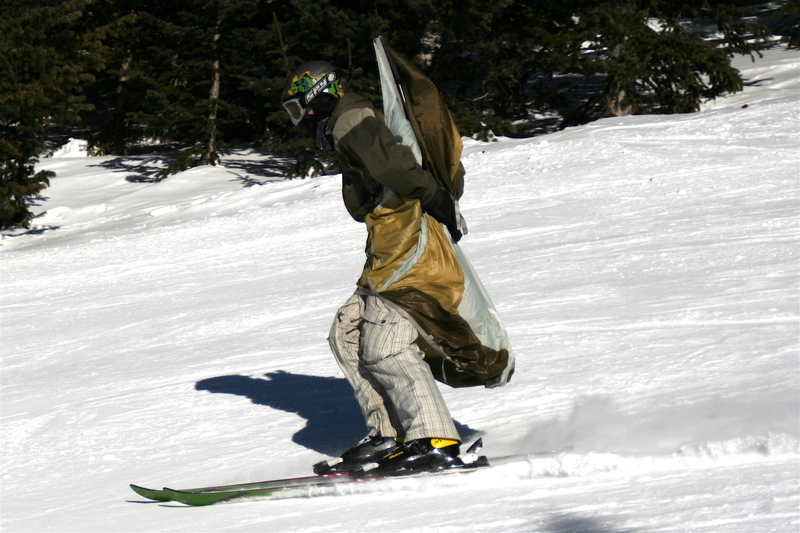 The four aerodynamically balanced pockets hold the wind and form a cushion of air in front of the skier. Leaning the upper body on this steady support gives a soft floating feeling at low speeds (15-20 mph) and a stronger sensation, similar to sky diving, at higher speeds (25+ mph). 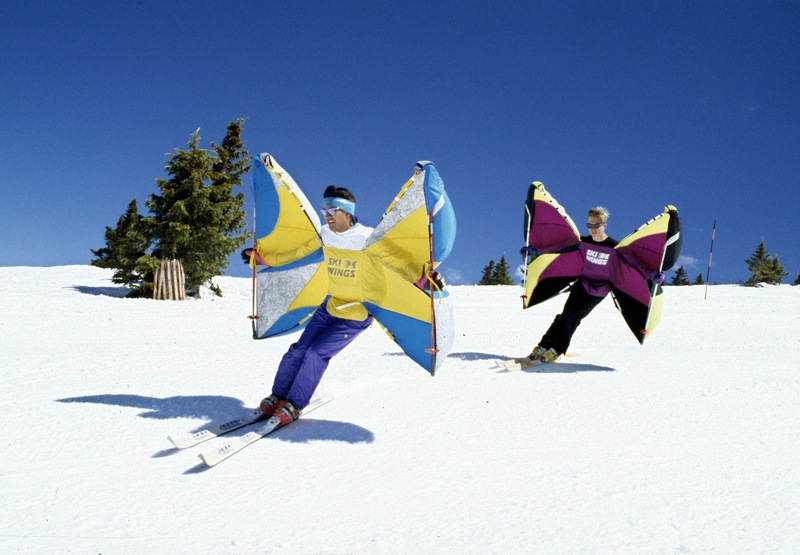 Easy to handle, Ski Wings can facilitate turning using one of four different wing positions, like a swimmer using different strokes. 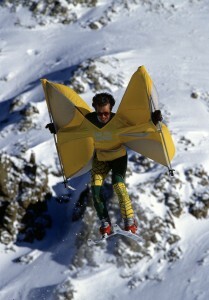 On flat areas or when acceleration is desired the wings can be pulled in to reduce the effect. 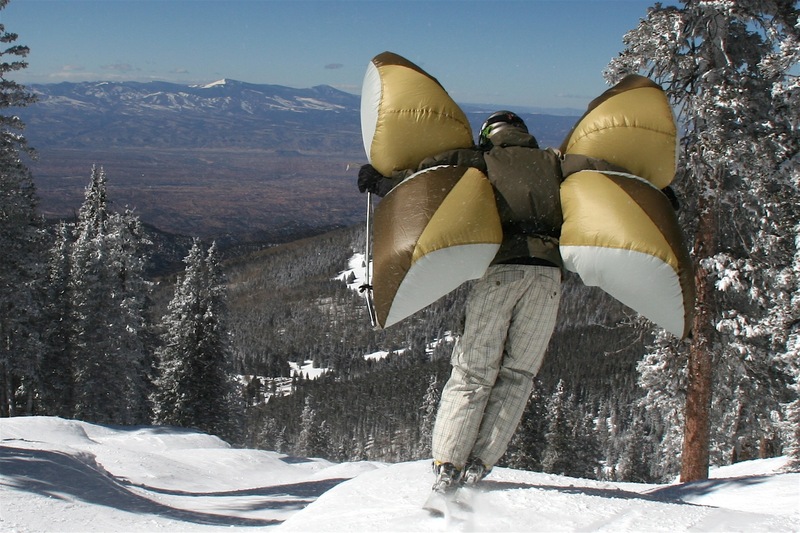 Ski Wings cushion of support improves balance and feels wonderful as it increases the floating phase that occurs during a ski turn. 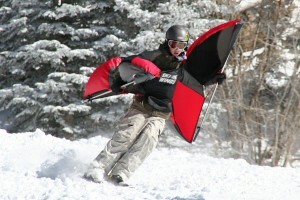 While they won’t make you go slow, they do limit top end speed and acceleration, much like skiing in deep powder. On cruising runs you can really lean your upper body down the hill and let Ski Wings do some of the braking which relieves leg stress and makes it easier to carve turns. 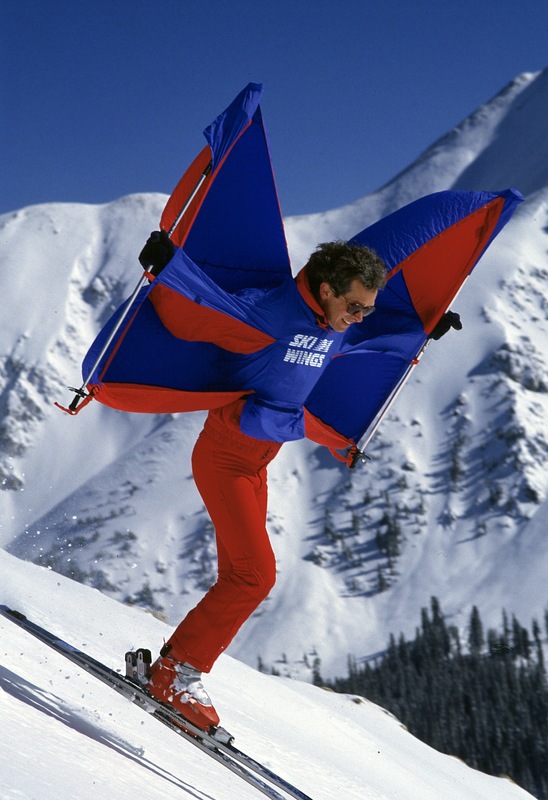 While not a true lifting device like a parasail or hang glider, Ski Wings do take some of the weight off your feet when you’re leaning downhill onto an air cushion. Pulling the wings in and then opening them quickly provides a quick boost which can produce a few inches of elevation with some practice. I love to jump small bumps and Ski Wings noticeably extend the floating phase or hang time (like a flying squirrel). 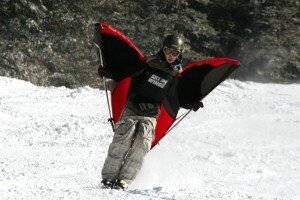 Many people enjoy skiing because it feels a bit like flying. Ski Wings increase that sensation. David Toland invented, patented, designed and sewed all prototypes; worked with the manufacturer in the production of 700 units, represented my product at trade shows, to the press, worked on sales, promotions and instruction at ski areas and retail stores. 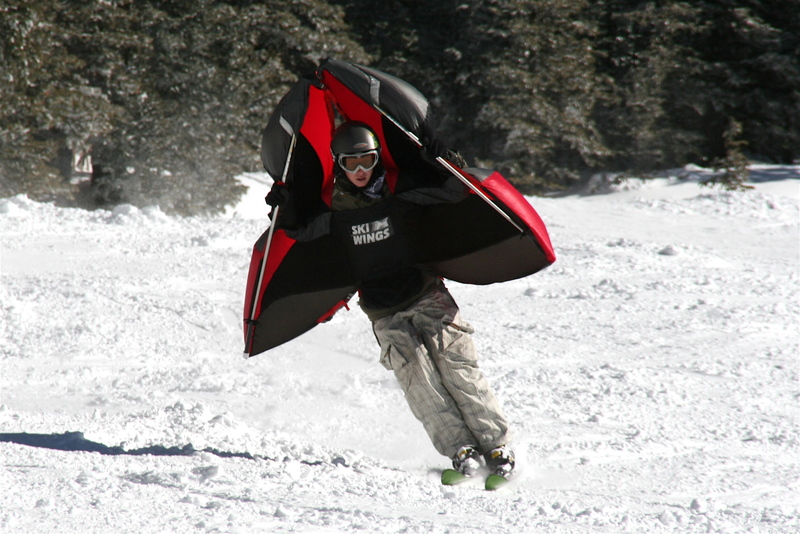 I hope to license Ski Wings to a company that has the resources to fund the manufacture and marketing of the most recent generation of my invention. 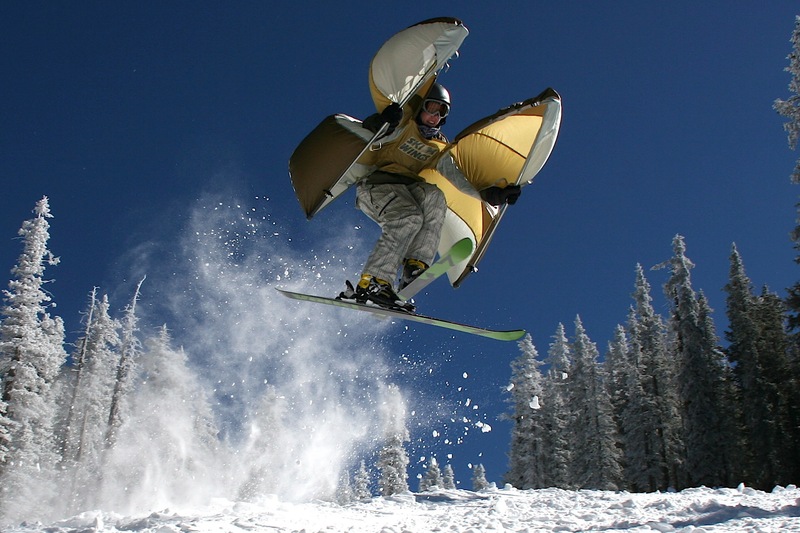 It now is a one-size-fits-all model with a much improved, more effective design. Ski Wings has great potential in North America, Europe and Japan. The on-slope response continues to be enthusiastic and the product advertises itself when in use on the mountain.